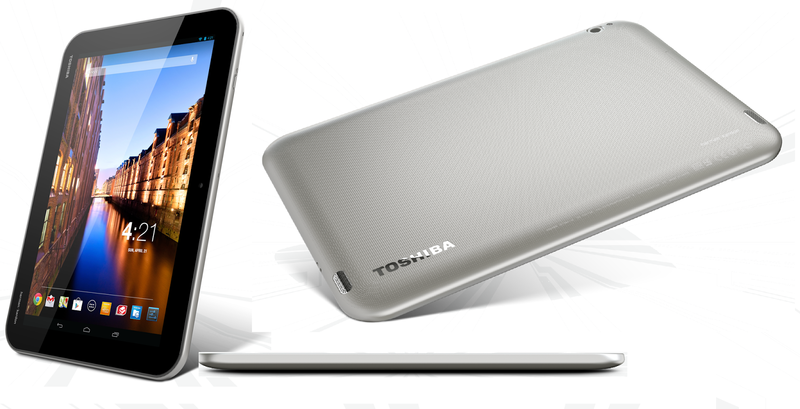 Toshiba isn't a very big player in the tablet space, but, well, maybe it's trying to become one. They announced, earlier this year, three Android 10-inch tablets, each competing at different price points, the Excite Pure, Excite Pro and Excite Write, which sell for $299, $499 and $599, respectively. Whatever qualities these devices have, it still remains that Toshiba's industrial design is far from attractive, which, in the tablet market, is likely to single-handedly make this device be a failure. The Excite Pro is the middle child in the Excite family. It offers some top-notch specs at an accordingly high price of $499 for the 32 GB version, which puts it in the same price range as the Nexus 10 with the same storage capacity, and is the same price as the entry-level 16 GB iPad 4. Its main downfall is its design, like I said before. Statistically speaking, it's not a svelte tablet. It's 10.2 mm thick (thicker than the 9.4 mm iPad 4) and weighs a reasonable 635g (lighter than the 650g iPad 4, but still considerably heavier than many Android tablets out there). The back is composed of two stereo speakers positioned on either side of the device, horizontally. These speakers are produced by harman-kardon, and can therefore reproduce some excellent sound. Then there's a Toshiba logo on the bottom left, and the top right houses a pretty good 8 MP camera with F/2.2 aperture lens, alongside an LED flash. The back is made of an industrial, rather unattractive gray plastic. The front houses some rather large bezels, and, above the very good 10.1" 2560 x 1600 display is the ambient light sensor and the front-facing 1.2 MP camera, and below the display is, on the left of the bezel, a Toshiba logo, and to the right, a harman/kardon logo. I find the two logos are too much of a visual interruption, and ruin the looks of the front of the device too. One logo is easy to overlook, but any more than that, and the front doesn't look nearly as clean as it should be. The display of the Excite Pro is at the top-notch configuration of the tablet market, as it features a large, 10.1" screen size and a whopping resolution of 2560 x 1600 pixels, which gives the display a very crisp 299ppi pixel density, which is on par with the Nexus 10, and higher than the iPad 4's 264ppi. The high resolution, combined with the display's IPS technology, ensures wide viewing angles, colorful, clear images and razor-sharp text. Of course, one does not simply pull off such a high resolution display without a lot of processing power under the hood. Never fear, though. The Excite Pro is perfectly equipped to handle even complex 3D games at its native resolution, thanks to its blazing NVIDIA Tegra 4 SoC. For those who don't know, the Tegra 4 has a Quad-core ARM Cortex-A15 processor running at up to 1.9GHz, with a low-power A15 companion core for handling light tasks and increasing battery life. The CPU is coupled with an equally fast 72-core GeForce GPU and 2 GB of DDR3L RAM. WIth such a high-resolution display and what appears to be a potentially power hungry SoC, one would be concerned about the device's battery life. Well, as it is, the thick profile of the device gives it the one big advantage of being able to carry a larger battery, and while the 33 Wh "Prismatic" battery included isn't the biggest ever seen of a tablet (the iPad 4 has a 42.5 Wh battery and is still considerably thinner), Toshiba claims it can get you through 9.5 hours of video playback, which is quite good, considering how many pixels are being pushed there. 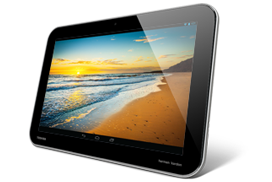 The Excite Pro, from a spec point of view, is one of the absolute best tablets out there. It marries a pretty beefy battery with an excellent display, industry leading performance, but unfortunately the looks of the tablet simply spoil whatever other advantages it has. In the tablet market, it's definitely better to have a better looking, more svelte tablet but with slightly weaker internals. And at $499 for 32 GB, there shouldn't really be a compromise on either aspect. While some people might not care about the bad looks of the device, there are still other alternatives which for the same price, offer almost identical performance and have designs which aren't painful to look at.